Sleater-Kinney, the formative post-riot grrrl band that evolved from Olympia, Washington's tiny music scene to become one of the most important rock bands in America, is back with a triple-KO: they're reuniting, touring the US and Europe and, on January 20, releasing No Cities to Love, their first album in ten years, since 2005's excellent The Woods. "We sound possessed on these songs, willing it all—the entire weight of the band and what it means to us—back into existence," Guitarist/singer Carrie Brownstein said in a press release. The band will release a box set, Start Together, available tomorrow, October 21, which will include their albums and a photo booklet. 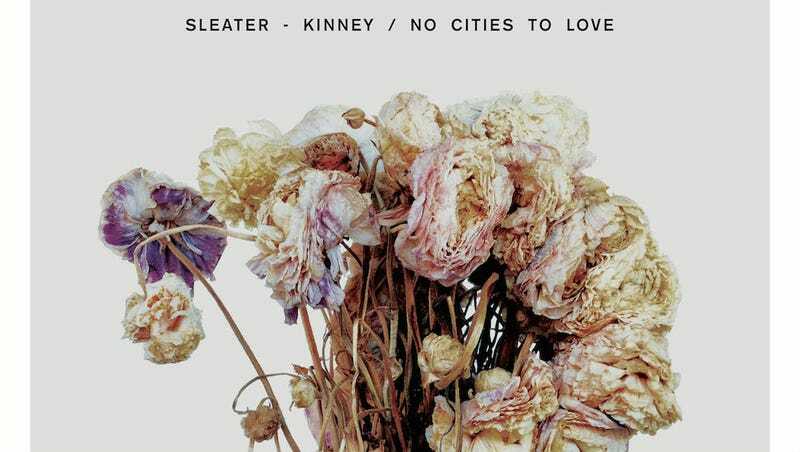 As a Sleater-Kinney mega-fan, frankly, I'm a little nervous—a band as beloved as S-K has a hallowed catalogue and a mythical status in the minds of their fans. I'm afraid it will be like Jay Z's post-retirement output, and ten years is a long time, and Carrie Brownstein is exponentially more famous than she was before—although I guess it worked for Fleetwood Mac, so we'll just have to wait and see. Either way, more power to these badass women, and the legions of fans whose lives have been moved and inspired by their music, mine included. Hear their first new song in a decade, "Bury Our Friends," in the Miranda July-featuring lyric video below, and download it for free here. Sidebar/related, I had the hook from this Cadallaca song in my head all weekend. Just FYI. These women been outchea.